Cascade: a process whereby something, typically information or knowledge, is successively passed on. This page shares a method I have developed over time for achieving truly transformative change in an organisation. 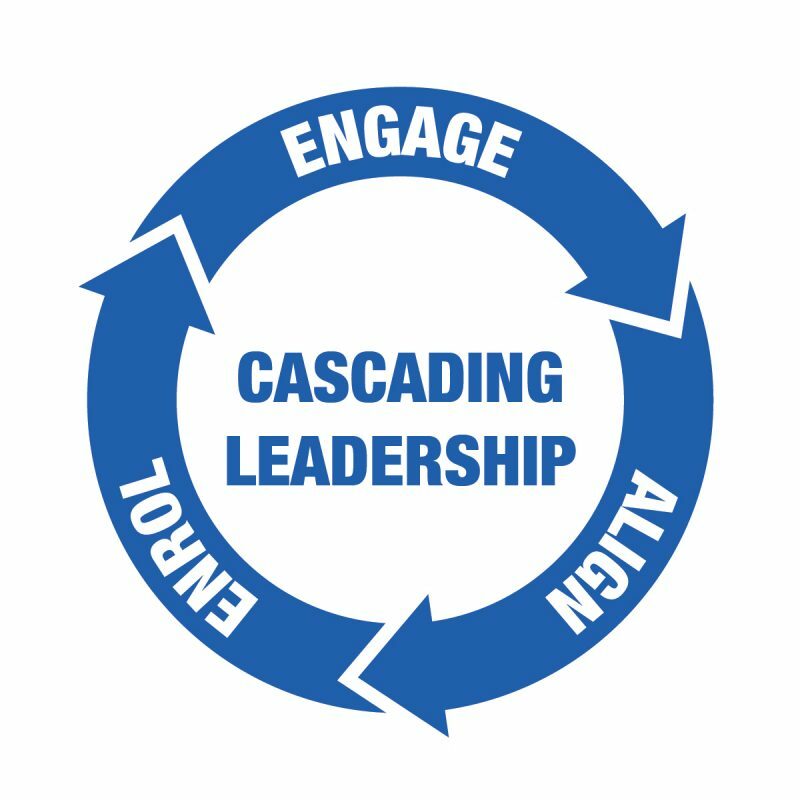 “Cascading Leadership” is a model derived and crystallised from experiences supporting leaders around change for many years. I hope this is of value to you as you look to lead change yourself for your organisation. This summary is about WHAT to do. If you’d like to talk about HOW to do it, I’d love to speak with you, email me at tom@tommccallum.com. We all know the model of the charismatic leader (eg Steve Jobs) who has a powerful vision and, almost messianically, is able to both engage and align everyone in their organisation around this so powerfully that they all move powerfully and in the same direction and quickly align around how to achieve it. However, this type of “top-down” leadership is increasingly shown to be too simplistic and often far less effective than it may once have been. So, what method can you use instead that is shown to be effective? The starting point for Cascading Leadership is simple, to slow down. I love and encourage the adage “slow down to speed up later”. Relationships are still one of the most powerful tools for business (and life! ), and trust takes time to build, so slow down and take time, as once trust is deeply held, speed of decision and action is faster. The first action, then, is to position the value of “slow down to speed up later” and ask for their trust around that. It is key to have them understand and trust that this will work, and at the same time trust is built over time step by step, so this in itself is iterative (as is the whole process of Cascading Leadership). Which comes first, to Engage or to Align? Having gained some space from the leader to slow down and not immediately look to engage everyone around their vision for change, what comes next? Before looking at that, let us first explore whether, in leading change, one should first look to Engage people around a vision for change, or instead first look to create Alignment around it? Let me here challenge the orthodoxy of looking to Engage people around change as a first step and instead say that, in this method, the answer is to iterate this repeatedly so that there is no “what to do first”, but a virtuous circle of engage, align, engage, align repetitively, each iteration deepening both elements and building more and more trust in the overall organisation for those within it as they truly feel part of the vision. The graphic shown here illustrates this iterative nature. Now, back to the process. Having gained some trust from the leader and permission to slow down, the first step is to polish the pebble. The pebble is the initial vision. The first step is to work 1:1 with the leader to refine their vision in a way in which they can engage the first tier of influencers in their organisation, typically their leadership team, their “first line reports”. At this stage, it is key that the leader a) distils their vision to only two or three words, and b) is open to it being shifted and changed from input from this first tier. This simplicity and open-ness will then engage them to work with the leader to refine the vision. In short, we polish the pebble first before sharing with anyone else. The second step is then to bring the leader and their team together (often for a two or three-day offsite meeting) to refine the vision, the second iteration if you will. The leader has already engaged them around the idea at their simple level, so now, by all being part of the iterative process, they can then refine this and align around the revised vision, so deepening their feeling of engagement. In this process, the leader drops their “pebble” in the lake with their first concise vision shared with their leadership team. At this point, that pebble has created the first ripple with the leadership team, achieved through slowing down and taking the time to first engage them then work with them to align around the refined next iteration. It is key to note that the initial vision will change as more and more people are involved. The leader must be open to input while remaining the “Keeper of the Vision” for all, releasing their own ego around their initial idea. Begin by anchoring on “slow down to speed up”, as there are no shortcuts here, yet the ROI of a deeply engaged and aligned organisation is immense. Next, there is no “which comes first, Engage or Align” in this method, cascading is iteratively building both. Cascade outwards, take the time to create ever-expanding ripples from that first pebble. At each “ripple” stage, share the Vision to Engage, then give true space for input into the iterative process, while also asking what this means to them and how they feel they can best help the organisation achieve the vision. As you can see, by slowing down to speed up, by iteratively engaging, aligning, engaging, aligning, this is a method of trusting everyone in the organisation to add their value to the vision and how it will be achieved, with ever-expanding ripples growing strength from everyone in the organisation from that first pebble from the leader. How might this work in your organisation? Every organisation is different, every iteration of the cycle will vary. If you are ready for cascading leadership, I’d love to talk to you about the possibilities for you and your organisation.